Never mind Windows 8's Metro interface and the inevitable iPad comparisons. Just as significant for the future of Windows is the question of what's under the hood. Those Metro apps – whether they're HTML5 or Silverlight – are running on a whole new system called WinRT, but the whole of Windows has been significantly improved to boot faster, use less memory, be more secure and handle networks better. We asked the director of Windows program management, Gabriel Aul, to explain how Windows 8 manages to deliver that. For instance, how come the preview version of Windows 8 uses a little over half the memory that the preview version of Windows 7 took up (going from 540MB to 281MB on a 1GB netbook, for example)? "When you have a lot of apps open," Aul told us,"you will have different apps will have [pieces of] memory that are identical but they each have their own copy; these things could be a common runtime or a shared library. Throughout memory you'll have lots of little 4K pages that are really identical but we're maintaining separate copies. We have a new feature called page combining; Windows can look through memory to find copies and basically condense them down to one shared copy. If an app writes to its copy of memory it splits apart and gets its own private copy again but the cumulative effect can actually be quite significant." "We said we would hold the system requirements and we did," Aulboasts. "We can do all this new stuff while still being even leaner than Windows 7. it's not just memory, we also optimised for CPU usage including coalescing system timers and adding this new dynamic sleep mechanism that allows CPUs to stay in a lower power state for much longer." Windows 8 boots in just a few seconds, "but one of the things we're getting used to with phones is not having to boot". The new state - which Aul calls Active Standby, although we've also heard the term Connected Standby - will give Windows 8 will have much longer battery life on low-power PCs running ARM and the next generation of Intel and AMD CPUs. "When we press the power button Windows 8 just turns on at once and it's fully active - it's even been refreshed with your latest email." That's because when the system is 'off' the Wi-Fi is still on, but only accepting traffic from servers you get email, messages and VoIP calls from. "If you look at the power chart, the system is just waking up for a second and doing a quick burst of background activity and then going quiet again. This is all controlled by the operating system so it's not like an app can arbitrarily wake the machine up, so the system can stay in low power mode for a very long time." If you leave a PC on standby when you get home from work and turn it back on in the morning – call it 16 hours – that should use up no more than 5% of the battery. Booting Windows 8 is more secure as well as faster, Aul claims. On PCs with newer UEFI BIOSes, the boot processes are protected by a certificate stored in UEFI, and anti-virus se can kick in while the PC is booting. "We call it 'early load antimalware'. After the secure boot process finishes validating all the components, we allow antimalware to load very early on and you have full protection from your antimalware throughout the rest of the boot process." And to prove that doesn't slow things down or use more power, he told us all the demonstrations of booting Windows 8 and all the power graphs have been on systems with early load antimalware running. Windows 8 will spot the best network connection you have access to and use that, but it's also smart about how expensive that can be. "If I have an Ethernet connection and a Wi-Fi connection and a mobile broadband connection, we switch behind the scenes. But mobile broadband is a special connection because it's often metred with a data plan, so we need to be extra smart around how we're utilising that because switching so seamless. In windows itself, in all places we use networking, we added the ability to understand if on metred network or not. So In Windows Update for example, we automatically pause any background downloads, whether you're set to Automatic Updates or not - and even if you go in and say I want to go download something you get a little warning that you're on a metered network." 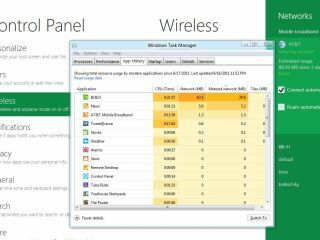 You can even go into task manager and look at the history for apps you've been using and see which of them have been using your 3G connection if you can't work out why you've used all your bandwidth. Now that's smart.